1. Fly with a GPS device that shows restricted airspace and remain clear of the danger area at all times. 2. First pilots of the day to phone the Warcop guard room on 01768 343236 and ask for the number for the Duty Range Safety Officer to ask for permission to fly (there will be occasional reasons to not allow flying that include the use of the dry training area by helicopters and other VTOL aircraft). 3. Fly with a VHF radio tuned to the CSC frequency of 143.700 (please do not use other club frequencies until leaving the site) and please carry a mobile phone in case you need to contact the guard room. 5. Do not touch any strange items, pick up, or remove any objects even if you believe them to be safe. 6. Call the guard room at the end of the day to confirm flying activities are completed. 7. Please check the forum for information. Please post details if you intend to fly and where possible agree who will call for permission. 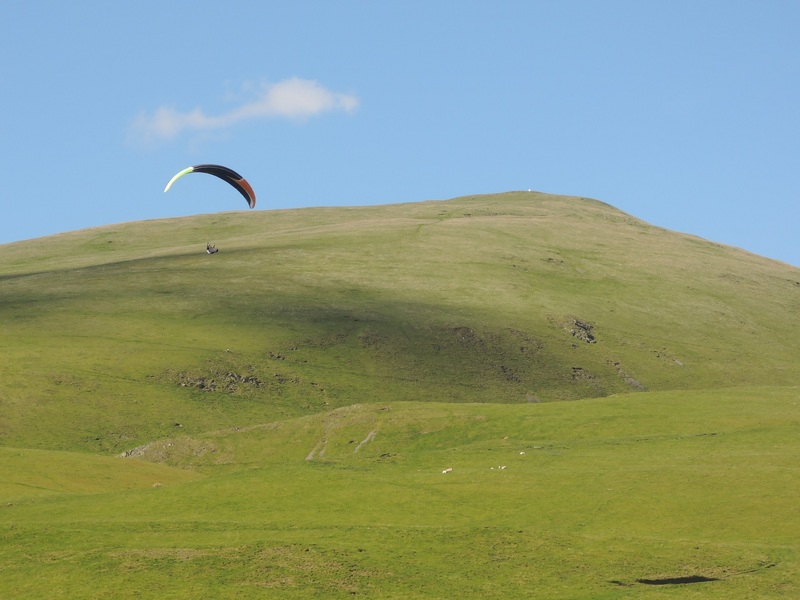 Murton Pike has been an informal paragliding and hang gliding site for more than 30 years, and has been take-off for many notable XC flights. 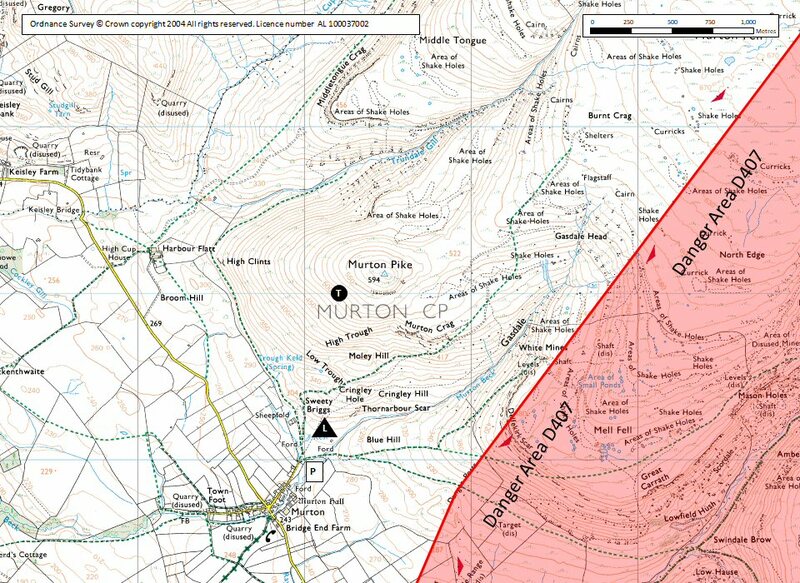 Murton Pike is owned by the MOD and is a publicly accessible dry training area adjacent to the live-firing Danger Area and Class D restricted airspace D407 associated with Warcop Training Camp. 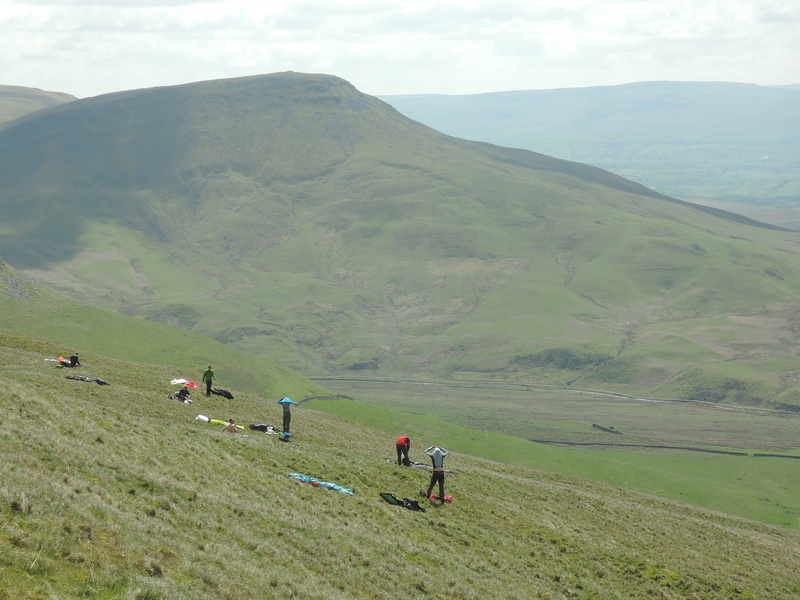 Intensification of training at Warcop has led to serious concerns about occasional unlawful use by paragliders. CSC is fortunate to have been given an opportunity to trial a licence for 12 months with the MOD to use the site lawfully, on the basis that we can demonstrate well managed access and reduce the risk of infringement of restricted areas. We can only achieve this with the help of all club members and visiting pilots complying with the Site Restrictions of Use. Units training at Warcop are responsible for safety whilst they are using the range and are briefed a month ahead of their visit. The safety brief will in the future include details of fliers using the site so that personnel responsible for range safety know we are there, and know that we are well briefed, so that they do not inadvertently stop training when they see wings in the air. The information in this site guide is being used both ways to learn how to operate this licence. Please feedback any comments to the CSC site officer so that this can be used to adapt how we operate the licence in the future. The postcode takes you to the middle of the village down hill from the car park. There are several ways to get to the village of Murton but by far the easiest is to go to Appleby-in-Westmorland and follow the signs to Hilton & Murton. These can be easily seen in both directions from the road that goes straight through the town on the East side of the river. Any route to Murton will take you to the crossroad in the middle of the village. From here you will clearly see the route directly uphill to the car park at the foot of the fell. 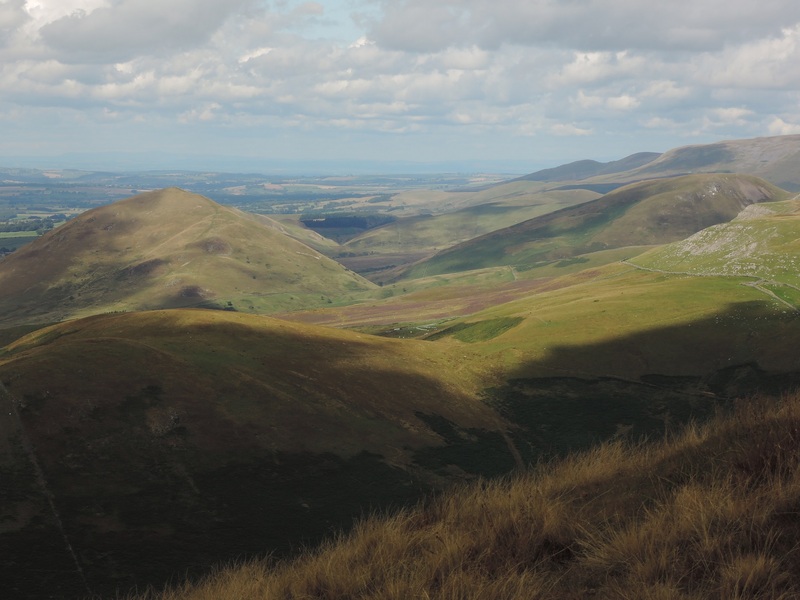 Access the Pike via the obvious track that runs from the car park at the top of Murton village and contour to take off depending on wind conditions. Permission to use the site is via a 12 month trial licence from the MOD that will be under close scrutiny and adapted as required. Please check back to the site guide and forum each time you fly to ensure you are current with Restrictions of Use. Please review the safety briefing and note any instructions relating to hazards. Warcop Training Area is under intensive use by many different units, sometimes under very short notice. Please report any incidents to the CSC site officer, positive or negative, to facilitate the ongoing management of the site, and the review of the trial. The main hazards associated with this site is the risk of infringement of Danger Area and Class D airspace D407. Please review the safety briefing by following this link. Do not touch any strange items, and do not pick up or remove anything, even if you believe them to be safe. No trophies (this includes parachute flare chutes). Fly with a GPS device to ensure you remain clear of restricted airspace. If for any reason you land in the Danger Area when it is active, do not move before calling the guard room with your position, and wait for instruction. Do not attempt to sneak out. Warcop would rather halt firing to get you out, than for you to risk your life. Take off can be anywhere on the main, grassy slopes that leads up to the summit. The wind strength and direction dictates the level and position of take off. It is not unusual to walk to the very top ... a fair hike! There are very few hazards of any sort and top/slope landings are easy almost anywhere. Note all the previous references to the D407 Danger Area. There are large, open areas close to the access gate/carpark. The ground slopes very slightly towards the gate and stonewall but presents no problem. Murton will soar OK, but is principally a thermal site and pilots intending to fly here should feel competent enough to read and use the brief thermal windows. Early in the day the wind is often off to the north, but generally swings increasingly onto the main face as the thermal cycles strengthen. Early to mid afternoon provides the best climbs ... later the wind settles and often strengthens from the SW and the return from an out and return has to battle against this in weakening climbs. Flying north along the ridge usually provides regular climbs with a soarable section of ridge as a Plan B. If Plan B fails the walk-out and retrieve can be awkward given the myriad of small roads. The Cross Fell Pennine range and Eden valley are well known for convergence as the Solway influence makes its present felt from mid afternoon. In a genuine SW airflow the Morecambe Bay SB can push in and also create stronger conditions around launch. Due to its rather conical shape Murton is primarily a cross country site. Warcop Danger area cuts off (without permission to transit) escape to the south and directly over the back is rather daunting with a long walk-out and difficult retrieve; as a result almost all XC flights go north along the main ridge. Although many flights north end up being open distance, a significant number (and often the main challenge) of Murton is the lengthy out and return or triangles that push out into the Eden valley. The Cross Fell ridge extending NW as seen from Murton Pike. Dufton Pike is the cone shaped hill on the left. Photo by John Hamlett. Take off on Murton Pike looking SE. The prominent Mell Fell is within the danger area. Photo by John Hamlett. Murton Pike with Ed Cleasby on landing approach. Photo by John Hamlett. 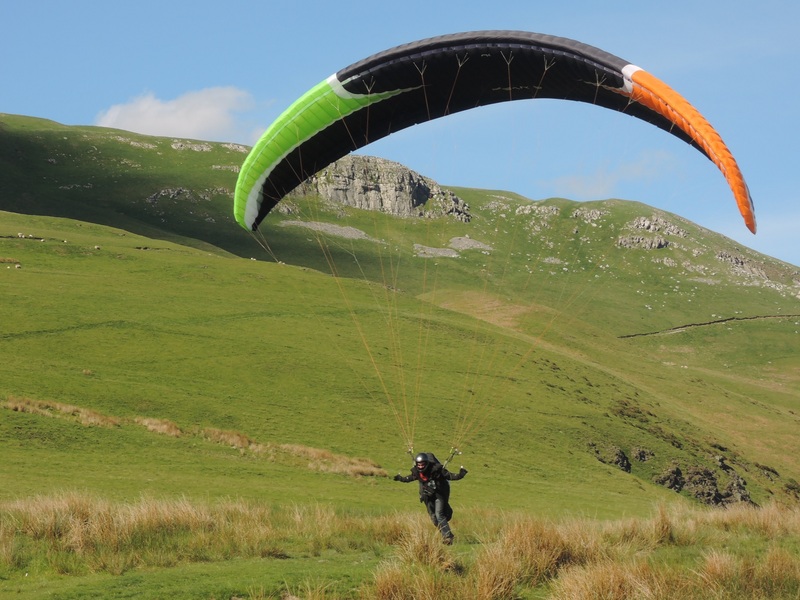 Ed Cleasby landing at the foot of Murton Pike. Photo by John Hamlett. Notes : Lovely country pub with real ales and good food.